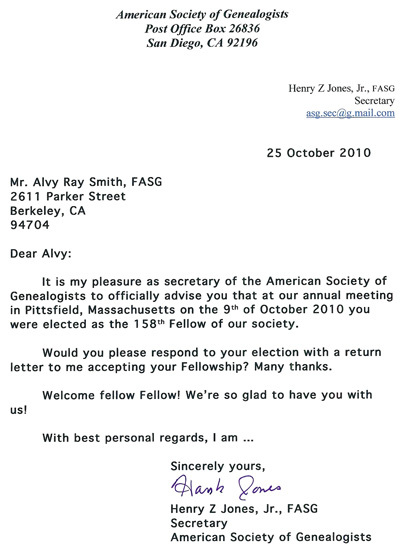 The Fellows of the ASG elected me one of the 50 Fellows at their meeting in Oct 2010. There can only be 50 at any one time. I am the 158th Fellow and can use FASG after my name henceforth. My mentors in scholarly genealogy come from the ranks of the Fellows. Helen Schatman Ullman, FASG, was the first person to introduce me to the field formally. Then Robert Charles Anderson, FASG, and Marsha Hoffman Rising, FASG, became my mentors for several years. It was the recent death of Marsha which opened up a slot in the ranks of the Fellows. Unbeknownst to me, one of Marsha's last acts was nomination of me to fill the vacancy of her own death.